Today is March 15th, and like Friday the 13th, some days are indelible in our collective memory. On this day in 44BCE, Julius Caesar was assassinated by Roman senators who were resentful of his usurpation of power from the senatorial class that, five centuries before, usurped it from the Roman kings. I think the lessons of tyrannicide are interesting ones. History is largely a record of horrible men doing horrible things to each other and then rewriting history. Alexander was not so great after all and must have caused the death of countless people. It could be argued that the world would have been much more unified and better off if he had not overthrown the Persian empire which was tolerant and largely secular. Alexander was popular because he moved us towards a one world government, just like Napoleon. It seems that most of the poor prefer one big dictator with one set of laws to one cruel and omnipotent local feudal lord. 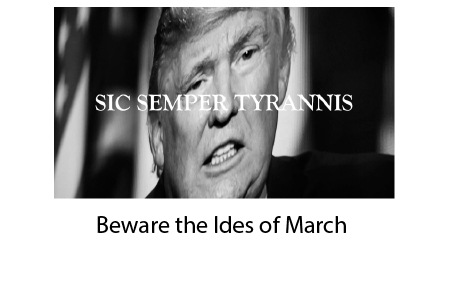 In Shakespeare’s retelling of the murder of Julius Caesar on this date, the phrase “sic semper tyrannis” is used. It means “thus always to tyrants” and was therefore what John Wilkes Booth wrote in his diary as something he shouted after shooting Lincoln. In point of fact, tyrants rarely are murdered because they are in league with so many “deep state” allies. In Roman times, the Pretorian Guard was the equivalent of the three-letter agencies and Secret Service and several times, they exercised influence to replace the emperor when he was not serving their interests. In the aftermath of the assassination of Julius Caesar, the people were very upset and his heir and adopted son, Octavian Augustus, eventually consolidated power and became the first emperor by defeating the allies of Mark Anthony’s brother. Augustus’ murderous purge only four years later, also on March 15th, 40BCE, killed around 300 senators and conspirators. Tyrannicide is in fact, a very dangerous game. The unintended consequence of the senators’ political assassination of Caesar was to render the republic permanently defunct and to usher in the age of emperors as gods on earth that persisted until the Theodosian Decrees and the Christianization of the Empire in the late 4th century. Unless you live in a closed society like North Korea, where you can easily assassinate all your enemies and suppress all the vengeful that are left behind, your karma will be a problem when you engage in killing a popular tyrant with allies. The current strife in Venezuela, although it appears like chaos from the outside, is the aftermath of would-be tyrannicide that was thwarted 16 years prior. The current President, Maduro was appointed by Hugo Chavez, a popular and populist president. Unlike the swift removal of Caesar, Hugo Chavez was briefly kidnapped in 2002 and an interim president was being instated as someone friendly to the ruling elite and international business. But in that case, the poor people rose up to protect the tyrant and the coup d’etat was stopped by sheer uprising of the populace. For a totally different picture that what our media feeds us, watch this video about the attempts to remove populist tyrant, Hugo Chavez as told by someone with first-hand knowledge. This story begins around minute 23 although the entire interview is fascinating as the reporter argues that white supremacy is at the heart of the conflict there. Instead of sic semper tyrannis, the general rule is that tyrants, with aid of the people, bureaucrats and military force, generally live long lives because they keep their own deep state apparatuses in power and making money. The persistence of populist leaders in power led to the 22nd Amendment, limiting American presidents to two terms. This was a result of needing to depose a very popular FDR who kept on getting reelected after programs that appeared to help the voting masses. The Business Plot to depose FDR was exposed by Smedley Butler before Congress and it is a good thing FDR was defeated by term limits because a coup d’etat would have been destabilizing to the nation’s institutions. 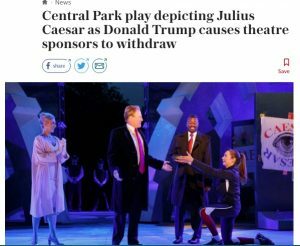 For those of you who fantasize about the removal of Donald Trump by non-electoral means as they did in a 2017 production of Julius Caesar, beware that President Pence and Pelosi are quite likely possibilities and that a subsequent purge of deep state conspirators could plunge the republic into a full blown police state like the brutal Roman Empire. There is a reason people cling to the semblance of the rule of law because that is what holds the republic together. I urge you to look into alternative media for a totally different interpretation of the “Russian Collusion” narrative that is documented by congressional testimony, under oath, of many of the participants such as Andrew McCabe, Jim Comey, Lisa Page, Bruce Ohr, Peter Strzok, and Loretta Lynch. The versions that they tell, under oath, paint a very different picture versus what the media has been telling us for two years. Now that we are learning that the press, judiciary, and the legislative branches of government are all extremely compromised by self-interest above service, we have to rely on independent media and the executive branch and its military and intelligence allies to preserve and protect the Constitution at all costs. No one wants to see factions of the military, surveillance agencies, and even state national guards fight each other. Such invasions of privacy are the end game in the loss of liberty and the pursuit of happiness. We must resist anything and anyone that undermines our Constitution and the rights guaranteed to us in the Bill of Rights, despite what good intentions some might allege. Let us not take lightly the proposals to abolish the electoral college, expand the supreme court, change the voting rights to include minors and undocumented workers, curtail free speech, restrict the right to bear arms, and to revoke our right to privacy. To do otherwise would surely be folly and mean the death of our Republic and perhaps the beginning of an even worse tyranny of emperors. I didn’t vote for Trump but a lot of people did. If you want to get rid of him, mobilize politically and engage the disenfranchised with an agenda, not just attacking Trump’s character. It seems the people in power would rather fight the left wing of their own party and maintain control of a failed institution than make change that will appeal to voters and regain political power. The power brokers of the DNC know the corporate media and many of the deep state and judicial holdovers are still in the tank. But they need to at least pay lip service to the disenfranchised and not just the bicoastal contented class. The people want to hear from Tulsi Gabbard and Andrew Yang because they have appealing new ideas when compared to other candidates who are so clearly curated and beholden to the beltway ecosystem that created them.